Put Dr. Jim Birkett and professor David Furukawa together in the same room and you have nearly a century of experience in membranes and desalination. The industry icons have been around since the early days of reverse osmosis (RO), yet they remain thoroughly engaged (and engaging). I recently had occasion to absorb the pair’s wisdom — equal parts history lesson and predictive analysis — at the AWWA/AMTA 2014 Membrane Technology Conference. It was a rare opportunity, and one that should be paid forward by sharing some of their insight. Birkett explained that after 35 years of progress we have nearly reached the point of minimum energy for seawater reverse osmosis (SWRO), thanks in large part to energy recovery devices (ERDs). The specific energy required for SWRO — dictated by chemical-free energy differences between feed water and permeate — has been very nearly mastered. To reduce energy much further, he said, we have to look at reducing peripheral energy requirements for pumping, pretreatment, posttreatment, and instrumentation and controls. Indeed, membranes are the central technology in the quest for renewed supply. As professor Furukawa observed, “Membrane treatment today is a multibillion-dollar worldwide industry” … and growing. Furukawa, chief scientific officer for the National Centre of Excellence in Desalination (NCED) in Australia, has worked in the field for more than 50 years. Through a five-year NCED project, he has helped secure six major desalination plants in five Australian cities. “Australia will never have to worry about a drought again,” he asserted. Furukawa, who has spent most of his career in R&D, focused much of his discussion on innovation and the bright future for membranes. He sees expanding use not just for desalination and water reuse, but also for point-of-use systems. This prediction speaks to one of the technology’s greatest strengths — scalability. 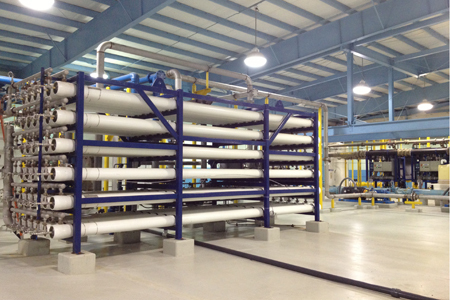 Membrane capacitive deionization (MCDI) and forward osmosis (FO) are new desalination technologies that can be sized and situated virtually anywhere. MCDI utilizes ion-exchange membranes, porous carbon electrodes, and electrical potential difference to remove salt ions, while FO uses an osmotic pressure gradient to transport water across a semipermeable membrane, with no energy required to drive the flux. Both MCDI and FO are finding application mainly in oil and gas (O&G) and mining operations, and both are exemplary of Furukawa’s Rule No. 1 for R&D practitioners: “The primary target may not be profitable, so look for secondary uses.” While the vision for these technologies was initially seawater desalination, the market led them to O&G — an opportunity and industry that should only expand as water-intensive hydraulic fracturing flourishes amid the shale gas boom. After more than 50 years of development, it seems membrane technology is ready for liftoff. It’s hard to overstate the significance of membranes for the future, or that of the “membrane masters” who charted the course.